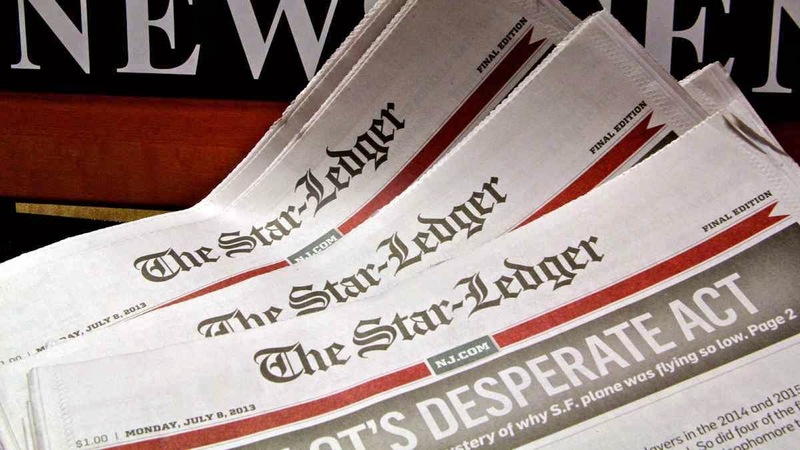 Newark, New Jersey-- New Jersey’s biggest newspaper, The Star-Ledger of Newark that also boasted being one of the nation’s largest is preparing to jettison 167 workers including 40 newsroom staffers. This paper attempted to transition into the Internet age with a website and addition of video reports. Obviously the problems with the newspaper’s bottom line were not cured. Traditional media as we knew it is on life support everywhere in the world. Broadcasters and newspapers have billions invested in presses and broadcasting equipment that has become a stone around their necks. Anyone can acquire adequate equipment for a few thousand dollars to send quality pre-packaged or live video around the world. Our new large television screens are rapidly making the transition to bring us web content along with traditional broadcast equipment. It’s only a matter of time before TV broadcasting towers come down everywhere. Cable providers are rapidly losing out to wireless providers. There are still those people to ignorant or otherwise trapped in a technology bubble, that rejects or otherwise has no access to computers. Those that can read newspapers, listen to radio or watch television. Those offline folk’s numbers are shrinking every day and soon they will have t accept the changes. Internet navigation has never been easier and is getting simpler every day. Broadband his improved and reaches nearly everyone. A large segment of the population is satisfied to get their news on YouTube, Twitter and Facebook. They have abandoned the traditional sources. The most difficult part of this media meltdown is the derailed careers, missed house payments and divorces ahead for unemployed journalists. How do people that invested more than ten years in a career deal with an industry depression? Those that are lucky to remain employed have shrinking paychecks and benefits. Twenty or more years ago the people unable thrive in a newsroom went to work for government agencies as public information officers. Now solid reporters and TV anchors are begging for those PIO positions. The only good news here is that the singular Leftist lockstep slant of mainstream media is dying too. News and opinion has become democratized by technology. The problem is most of the bloggers are working for free or next to nothing. Matt Drudge the granddaddy of bloggers made millions by aggregating news from multiple sources. He created a single one-stop international news page with a Conservative flavor. Some bloggers have found lucrative careers like Alex Jones by over-sensationalizing every conspiracy theory to a hungry audience of believers. Others that cater to a specific audience like firearm aficionados have built audiences and appropriate advertisers. The greatest journalist in the world won’t succeed on the Internet with out learning web promotion as they navigate in a world of catchy buzzwords and meta tags. Who will pay for hard-hitting investigative news exposés of corruption, fraud and conspiracies? Correspondents must travel, stay in hotels to get interviews and gather records and information for stories that sometimes just don’t develop. Breaking a huge news story is a waste if you don’t have an audience to appreciate it. As other news providers learn of a big scoop they will plagiarize it and make it their own. Copyrights are almost impossible to enforce on the Internet when the offenders are either off shore or don’t have deep pockets. The whole media thing will somehow shake out but where it ultimately goes is anyone’s guess. I would say more but I don't know if my comments will get approved. We have noticed the reason why we are having this *media* war is because we are transitioning to a global currency and once the US Dollar is dumped the Media will be into the electronic Amero and tout it off. There are two groups fighting for world control and that's the rich bankers who are afraid to change their ways so they *adapt* to the new rules and the Communist Marxist who want to steal from the rich bankers and form mind control programs on the population and use us as guinea pigs in experiments. That's all I am going to say for now but keep an eye out on these forces as we head towards a one world system. Both sides are working on *the cloud* where eventually YOU won't even have a computer that you own. You will have the box but all you're data and records will be in a far away server that they control. You put you're records in the hands of either communist brothers to control the access or rich greedy bankers who don't give a rip about you. No individual businesses anymore that actually do care will survive the globalism.